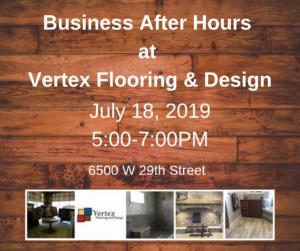 Please join us for an evening of networking at Vertex Flooring and Design on July 18th from 5-7PM. Come ready to meet new people and make connections important to your business. Bring plenty of business cards to pass out! Good food and drinks will be provided!